The President is lying and covering up, possibly to the point of treason, as is the Vice President, the Secretary of State, Secretary of Defense and maybe more. 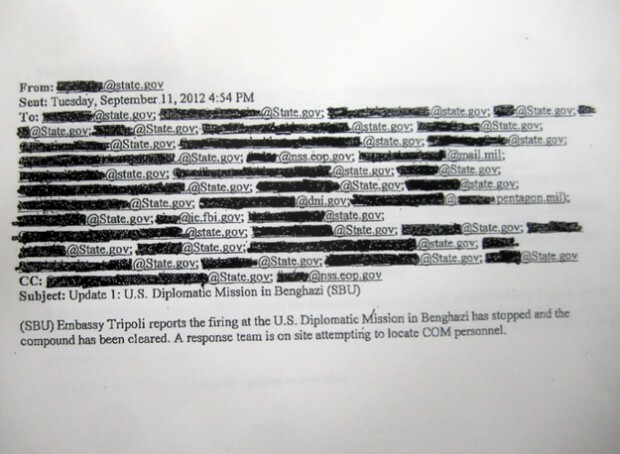 Less than one week after the September 11 attack in Benghazi, I reported (with research provided by Glenn Beck and The Blaze) that ambassador Stephens was probably CIA and was gunrunning; providing arms from our government to the rebels in Libya who were either Al Qaeda or an affiliate group. He was also providing weapons to Syria, brokered through Turkey. As you read this account, I remind you to recall the lies put out by this White House regarding the YouTube video. New evidence has emerged, via memos and e-mails, which prove the validity of the attacks on the CIA safe house. Don’t believe reports that this was a consulate or even an embassy safe house. Rest assured, this was a CIA safe house. 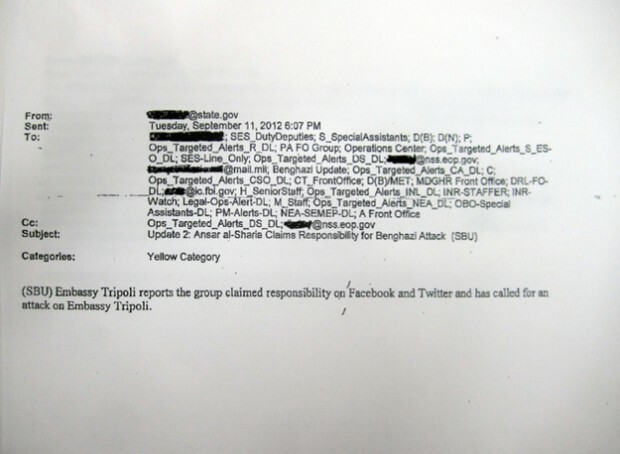 At 12:54 PM the White House situation room received an e-mail that someone was watching the CIA safe house in Benghazi. So what was the ambassador doing at that safe house on September 11, in Benghazi, terrorist central, knowing the house was being watched and also knowing he was a possible target? Well, he was having dinner with the General Counsel of Turkey. I’ll remind you that Turkey was the go-between for weapons transfers from Stevens to Syria. Reports are that some 400 tons of weapons have been moved into Syria. Coincidentally, President Obama is a friend of the Prime Minister of Turkey. As a matter of fact, when Obama was elected in 2008, he called his friend, the Prime Minister, before calling any other world leader. A little odd, don’t you think? As an aside, the Turkish prime minister advocates both Shariah law and an Islamic Caliphate. Quite an interesting bedfellow for a president of the United States. So at the same time the White House receives the e-mail that the safe house is being watched the ambassador and Turkish General Counsel are having dinner. One hour later, the Turkish General Counsel leaves completely unharmed and unmolested, through the front gate. Why was the General Counsel there? What did they discuss? Were the terrorists working with Turkey to take out Stevens and on whose orders? Was the Turkish official sent in to effectively hold Stevens their while preparations were finalized for the attack? It seems to me that the General Counsel or the Turkish government must’ve been involved or he would not have been allowed to leave unscathed. Those watching the house must have known who he was. About an hour after the Turkish official left, the attack began. And what about the drone? Someone authorized a drone be sent over that area. Although we don’t know when it was authorized, we now know there was live video feed, real-time, of the attack. The video feed from the drone was sent to the White House situation room, the CIA at Langley, the State Department and DOD. The Secretary of Defense, Leon Panetta, had a meeting with Obama and Biden around 5 PM, almost a full hour after the safe house attack at 4:05 PM and three hours after the original warning. The meeting took place in the Oval Office, not the situation room. By all accounts the president never made an appearance in the situation room. But what’s the big deal? It was only 4 Americans being killed by terrorists. It’s not like we were taking down Osama bin Laden or anything. What did the president do? Did he stick around to coordinate rescue and counterattack efforts? Apparently not. Reports are that he went up to the residence and went to bed. By the way, there was no counterattack authorized. The US military was standing by at several locations with troops, special ops personnel, ships, helicopters and assorted other aircraft. No order was ever given for any of the above to be utilized in either rescue or counterattack. Why? No one knows, yet. No one may ever know. At 6:07 PM another e-mail comes into the White House situation room that Ansar al-Sharia claimed responsibility for the attack. If this investigation is permitted to continue we will surely find that the Al Qaeda affiliate, Ansar al-Sharia, is the same group ambassador/CIA agent Stevens had provided weapons to. A cruel irony; being murdered by the same weapons that you provided to your murderers. This is why Glenn Beck says the White House and everyone else who is culpable for this atrocity is covering it up. 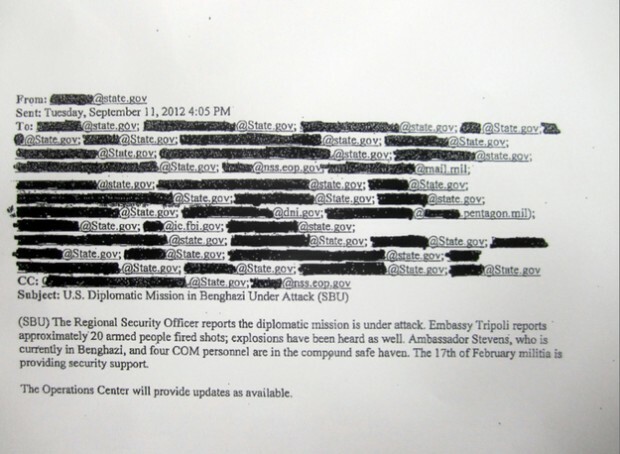 Obviously ambassador Stevens could not have acted on his own. By the way, the gunrunning still continues, with a verified story from Russia, that Syrian rebels now possess United States Stinger missiles. Like their counterparts in Egypt and Libya, the Syrian “rebels” are neither rebels nor freedom fighters. They are, in fact, connected to or are wholly owned subsidiaries of Al Qaeda and the Muslim Brotherhood. Even the New York Times has confirmed that the U.S. is using the Muslim Brotherhood to arm the Syrian “rebel” faction. Claire Lopez, a former CIA officer, told Beck she believes that the Obama administration is helping the Muslim Brotherhood come to power in Egypt, Libya and Syria. She said that next maybe Jordan and/or Saudi Arabia. Where does that leave America’s greatest ally, Israel? If the full story of this event is allowed to see the light of day, those responsible for the inaction and cover up , including possibly the president, will and should be indicted and imprisoned. a little odd that the pres.went to bed so early… oh yea,he had to go to vegas the next day for a fund raiser (i don’t believe he did “go to bed”). good grief,even jimmy carter put superfluous activities on hold while he was initially dealing with the iran hostage situation.not this pres. this is worse than watergate and fast and furious rolled into one. This is Watergate times 10. I don’t recall anyone dying during the watergate breakin or cover up.